AppliedMicro (AMCC) announced the availability of the Catalina SoC (APM86491) for low power and cost effective NAS systems today. The previous generation version (APM82181) was the heart of the Western Digital My Book Live reviewed by us last year as well as the recently launched My Book Live Duo. Serving to remind us that the PowerPC architecture is still around in consumer devices, the new platform manages to reduce the cost of USB 3.0 enabled NAS systems by integrating two USB 3.0 controllers (one host and one host/device) in the SoC. In the USB 3.0 enabled NAS systems we have seen so far, the controllers are from NEC or Fresco Logic, and they interface with one of the PCI-E lanes in the SoC / chipset. By integrating the USB 3.0 controller, the BOM cost is bound to get reduced. 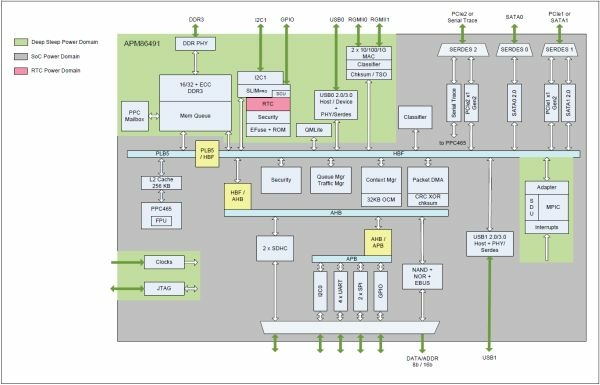 AppliedMicro also indicated that the Catalina SoC has QoS, TCP offload and packet classification engines to help interface better with 802.11ac radios connected to either of the SoC's two PCI-E ports. In addition to the two PCI-E and two USB 3.0 ports, we also have two SATA ports and two GbE ports. Instead of targeting the SMB market with support for 4 or more bays, this solution seems to be geared towards an all-in-one appliance with the ability to function as a router, a wireless access point as well as a network attached storage device. The Catalina SoC has a single Power 465 core (along wtih a FPU) operating at 1 GHz. 64 KB of L1 cache is equally divided between the instruction and the data. 256 KB of L2 cache rounds up the internal memory subsystem. 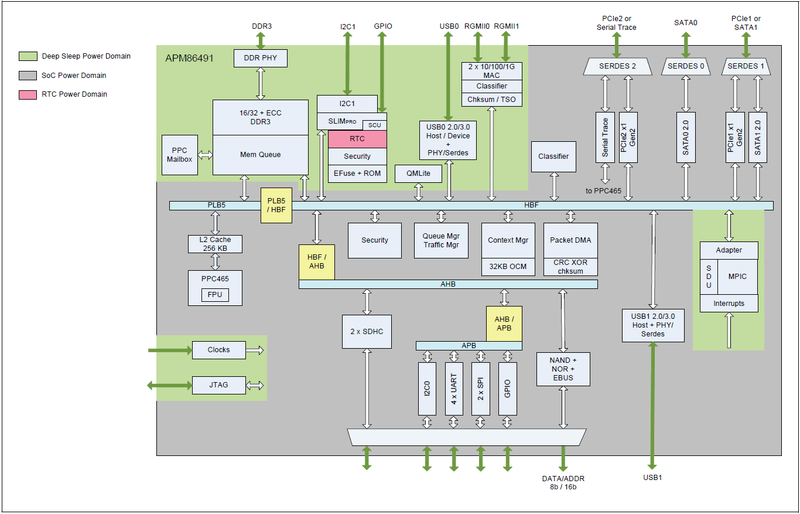 The SoC's DDR3 interface can be clocked at 533 MHz and can run in either 16 or 32 bit mode. NAS platforms based on the Catalina SoC are expected to operate within a power envelop of 3W (excluding the drives, obviously!). It is refreshing to see that the consumer electronics market is not all ARM or MIPS. PowerPC based NAS platforms have proved to be quite cost effective and power efficient and the APM86491 will be expected to carry that forward. We will be having some hands-on time with the Catalina platform at CES. You can look forward to more coverage of AMCC's efforts later this week. It could also be an option for VIOP phone systems as well.